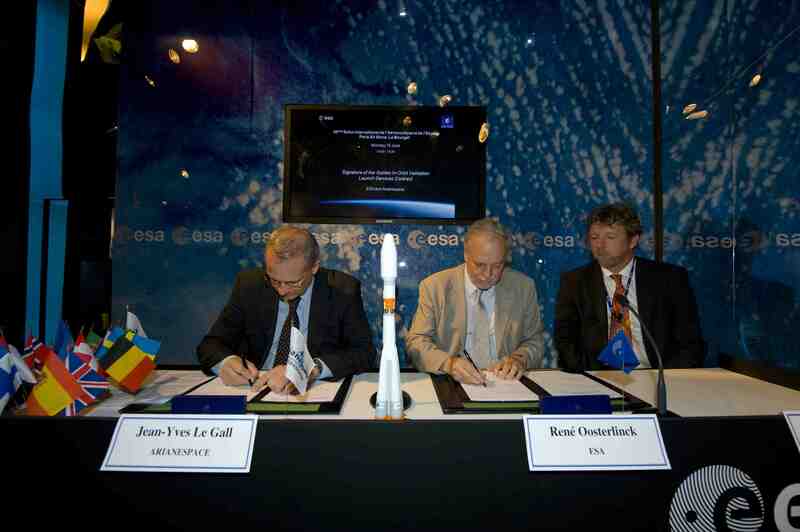 The European Space Agency (ESA) today (February 2, 2012) signed a contract to build a further eight Galileo satellites, alongside other agreements to modify Europe’s Ariane 5 launcher to carry four navigation satellites at a time. The signing took place at the European Commission’s center in London, England, in the presence of European Commission Vice-President Antonio Tajani and UK Universities and Science Minister David Willetts. In total, three contracts were signed: one with OHB System AG (DE) for eight satellites at a cost of €250 million (US$328.7 million); a second with France’s Arianespace for a booking option of up to three launches using Ariane 5 (a booking fee of €30 million — US$39.4 million); and a €30 million contract with Astrium SAS, also of France, to enable the current Ariane 5 launcher to carry 4 Galileo satellites per launch. Under the latter contract, Astrium SAS will develop a dispenser that can carry and then release a quartet of satellites into their target orbits. 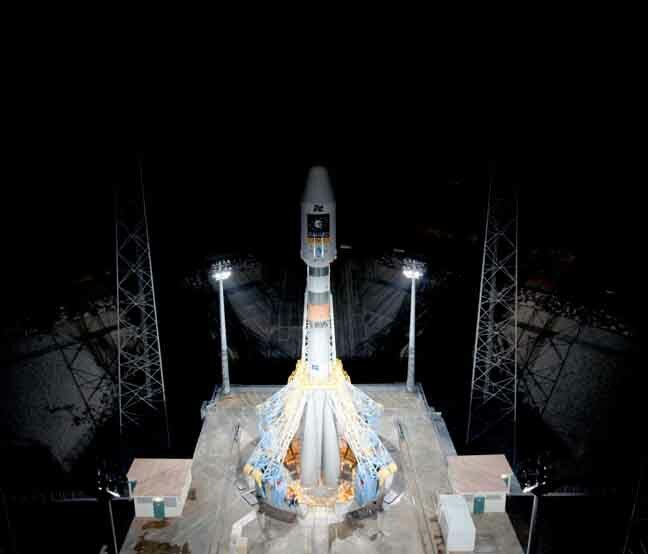 The requalified launcher, known as the “Ariane 5 ES Galileo,” should be available by the second half of 2014, for launch from Europe’s spaceport in French Guiana. Galileo satellites are currently launched in pairs aboard the Russian Soyuz rocket. The additional satellite buy was made possible by cost savings under the current Galileo budget. Cost overruns had previously forced European officials to reduce the initial launch plan to 18 satellites from 30 by the end of 2014. In January 2010, Germany’s OHB-System became the prime contractor for the initial €566 million ($777 million) design and manufacture of 14 Galileo satellites, beating EADS Astrium for the key contract. The company teamed with Surrey Satellite Technology Limited (SSTL, United Kingdom). OHB has been producing one new spacecraft every six weeks under the existing contract. SSTL, which also built the first Galileo In-Orbit Validation Element satellite (GIOVE-A), is responsible for the satellite payload. On January 25, SSTL held the grand opening of the facility in Guildford, United Kingdom, where the navigation payloads are being built. Housed in the 3,700-square-meter Kepler Building, the manufacturing line began operations in April 2011 and has steadily been scaling up operations. The first two Galileo IOV satellites were launched last October 21 and began broadcasting in December.The remaining two IOVs will be launched at the end of this summer. The definition, development, and IOV phases were undertaken by ESA and co-funded with the European Commission (EC). The subsequent FOC phase will be managed and funded by the EC, which has delegated the role of design and procurement agent to ESA.